Last week my church hosted three representatives from the local Turkish Muslim community at what is usually our Wednesday evening Bible class. This was a big step for my church. We’re part of a christian movement (and there are many others like us) that has historically invested a great deal of energy in telling others why they’re wrong. We would use examples such as, “If you see a man about to fall down a hole it’s your responsibility to yell and warn him.” So we yelled… a lot. We yelled at Baptists. We yelled at Methodists. We yelled at Catholics. In more recent years we yelled at Community Churches (who are really Baptists in disguise). We yelled at the New Age Movement. And in more recent years we’ve joined the rest of the country in yelling at Muslims. Christianity is inherently a missionary religion. I participate and support my movement’s evangelistic / proselytising efforts. I believe that God still wants all people everywhere to repent and that salvation is found in Christ and him crucified. Christianity is inherently a peaceful religion. Christianity is inherently a loving religion. Christianity is inherently a religion that makes the world a better place. I have come to realise that yelling doesn’t accomplish these purposes. Yelling creates barriers. Yelling, regardless of the words, immediately communicates that I’m right and you’re wrong. The person that’s yelling isn’t listening. If peacemaking is as essential to the practice of my faith as proselytising, I have some thinking to do. There is an onus upon me to share my faith in ways that communicate peace on my part. When I recognise that a person or group of people don’t want to hear of my faith convictions because they already have their own, I have a responsibility to live peacefully, and lovingly with them. I am convinced that in order to live peacefully with my Muslim / Black / Catholic / Other nieghbours I must first demonstrate my respect for them by listening to them. Who am I to demand they listen to me unless I’m willing to listen to them? Three Muslims walked into our church… and our church listened. We ran out of time. I had more questions. They had to run afterwards to a funeral so there was no informal visiting. But a conversation was started. A relationship began. And now when we see Muslims on TV I hope we see Mamut, Fazir, and Mufasa. I hope we see people we know we can live with peacefully. I hope we see people we can love. Living peacefully with people different from ourselves doesn’t mean that we endorse everything they think and do. It doesn’t mean that we understand and value equally all their customs and cultural heritage. It doesn’t mean that we feel totally comfortable when they speak in a language we don’t understand. Living peacefully means that we respect others as sharing a common humanity. It means respecting their right to different beliefs as we hope they respect ours. It means acknowledging that our culture isn’t the best in everything. Living as peacemakers means loving our neighbours as Jesus loved us. July 2014: Eric Garner (black) is choked by (white) police and dies on Staten Island for selling cigarettes on a street corner. November 2014: In Cleveland, 12 year old (black) Tamir Rice is shot by (white) police for pointing a toy gun at people. April 2015: Walter Scott (black) was shot in the back while running from a (white) police office after a traffic stop in North Charleston, SC. April 2015: Unrest envelops Baltimore after Freddie Gray (black) died as a result of not being properly restrained while being transported in a police vehicle. 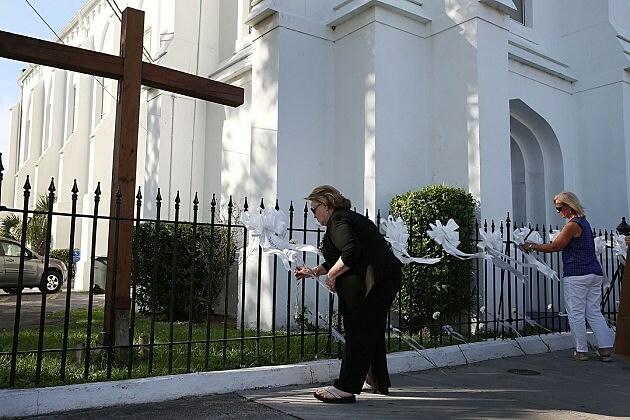 June 2015: 9 (black) people were shot and killed at an AME church in Charleston, SC by a young (white) male. In the face of this barrage of shameful violence, I want to share some of my experiences and resources that I’ve encountered of the past few weeks that give me hope for the future. In many ways it begins with the response of the families of those 9 people killed in the Charleston church shooting. Instead of responding with violence, the went to the courthouse and addressed the killer, Dylan Roof. In a dramatic and unexpected moment they expressed both their grief and forgiveness to Dylan. From the outside this expression of grace seemed Christlike and exemplary to others engaged in racial conflict. But it’s not that simple. I also appreciate those family members that called upon him to repent. It’s very easy for white America to sit back and expect that past wrongs be forgiven by minority populations and then we can all just move on. There’s a Godly onus upon white government institutions, white corporations, white churches and white families to acknowledge past wrongdoings and repent of those sins. We cannot ask black America to forgive us for sins we refuse to admit. So how do I find this hopeful? 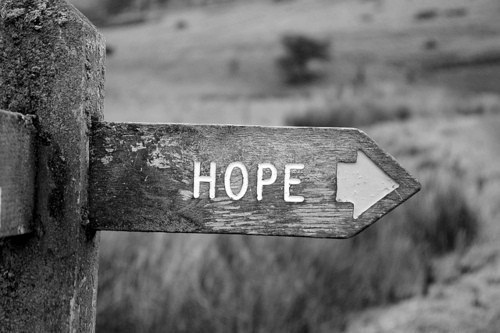 I find hope because the conversation is starting. I find hope in the LA Times article that discusses the difficulties of forgiveness and atonement. I find hope in the airing of alternative perspectives such as those expressed in this article, “We should be sick and tired of apologizing for who we are and what’s happened to us. If I hear that on the news again, I’m going to throw up.” That statement makes me uncomfortable, but it belongs in the conversation. I find hope in this interview of civil rights leader John Perkins that was conducted at the North American Christian Convention a couple of weeks ago. In graphic detail he describes the moment he decided to pursue reconciliation rather than revenge. He also calls for repentance to accompany forgiveness. I believe you will also find this interview with NACC keynote speaker, Sean Palmer, challenging as he reminds us that racial reconciliation is a Gospel issue, not just a nice idea. I find hope because when I attended Lipscomb University’s Summer Celebration last week I found people wanting to talk about racial reconciliation and church integration. Randy Lowry, the president of Lipscomb hosted a two-part Forum on Racial Relations in Our Country and Our Church. Dr Lowry mentioned that about 18% of Lipscomb’s students are from minority populations. Buddy Bell, the minister at Landmark Church in Montgomery, Alabama, used his keynote address to support the removal of the Confederate Flag from public institutions and to encourage white Christians to talk with African-Americans about what the flag means to them. I had lunch with a friend who described a recent unity church service he’d attended where members of the African-American churches were given a venue to describe the discrimination they’d faced in that town. He told how (among other things) they recounted the reality of a hospital segregated by race and the story of a (black) woman forced to give birth on a mattress in the floor of a janitor’s closet while beds were available but off-limits in the white wing of the hospital. Not that the story is unique, but I find hope because this story was told within a church. I find hope in the stories of different people I met who had participated, sometimes with their church groups, in a tour organized by Lipscomb of significant civil rights sites and the way that impacted their attitudes and worldview. I’m encouraged that Summer Celebration had two sessions addressing the issues of racial reconciliation in churches. Much work and discussion lies ahead. Both NACC and Summer Celebration are overwhelmingly attended by white Christians. So these forums can have all the discussions they want, but changes also need to take place. Talk must lead to action. One racial unity service a year, or even two, isn’t enough. But it is a beginning. I am convicted that the church can fulfill it’s mission as a force for reconciliation within our society, but there’s still a long road ahead. I want to leave you with a powerful sermon that was delivered at Summer Celebration. Dr David Fleer is a homiletics professor at Lipscomb University. The sermon presented at Summer Celebration is available for purchase and download HERE. But Dr Fleer presented the same basic material at a racial unity service just a few days before. I encourage you to listen and pick it up in this video at the 30 minute mark. If your spouse tell you, “We have a problem.” How do you respond? You can try to convince him that he’s wrong. You can tell her that she’s taking everything the wrong way. You can suggest that you’re not the problem in the relationship. You can argue that the relationship is better than it used to be. You can deny, deny, deny. But that just means you’ll be surprised when you find yourself sleeping in the car. Alternatively, you can ask questions to understand the problem. Perhaps it turns out to be a misunderstanding that can be remedied by talking. More likely, resolution of the problem will require a change of behaviour. White America, we have a problem. We know this because black America keeps telling us. We know this because of Ferguson. We know this because of Baltimore. We know this because of Charleston, South Carolina. And we know the issues are complex, partly because of Rachel Dolezal. She also spend considerable time discussing and describing “Privilege”, which must exist whenever one group of people experience prejudice. Dr Cleveland responded that until these issues are resolved, there’s an ongoing need to keep them in America’s consciousness. During the lunch break a white woman at my table shared that her (white) church had someone make a presentation to them recently where much of this material was presented. She said it was new to her at the time and she needed to hear it. If you’re reading this blog you already know there’s a problem. You drive around on a Sunday morning and you see the vast majority of churches segregated by skin colour. You read the news stories about the shooting this week in Charleston, and see that the description of the church as an “African-American” church reveals a spiritual issue of which this shooting is the most recent manifestation. Sometimes this segregation reflects the neighbourhood demographics. More often it reflects the comfortable ambivalence of the members. Centuries of division demonstrate the stark reality that no answer will be simple or easy. But here’s part one of the solution: Convince people of a problem. I’m not a World War 2 history buff, so I won’t attempt to make exact statements about why it took the United States so long to enter World War 2. What I do know is that US involvement increased dramatically after the Japanese bombing of Pearl Harbor. I’ll suggest that one element of that increased involvement was the widespread recognition of a problem. Once the problem was clearly identified, people were willing to sacrifice for solutions. As long as people convince themselves that race relations in the United States were solved in the 1950’s & 60’s by Dr Martin Luther King Jr, and the process of school desegregation, we’ll never resolve the issues that continue to confront us today. If you’re a church leader, you have a platform to peel back the band-aids and expose the continuing sores of racial prejudice, both implicit and explicit, in this country. Your church needs you verbalise the problems. Your community needs you to speak against prejudice. Your God expects you to speak up for those whose voices aren’t being heard. So speak.